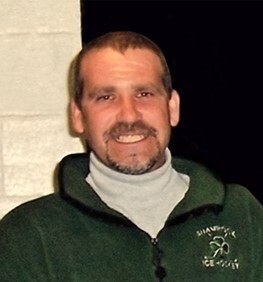 Scott Matthew Glenn, age 48, of Carlisle, passed away unexpectedly at home from atherosclerotic cardiovascular disease (ASCVD) on Tuesday, July 31, 2018. Scott was born on Friday, November 7, 1969 in Carlisle to Sara “Sally” Mae (Evelhoch) Glenn and the late Frank Harris Glenn, III. Scott’s survivors include his son, Brendon Schwartzbauer of Mechanicsburg; his mother, Sally Glenn of Carlisle; his brother, Andrew Glenn and his wife, Karen, of Gardners; his sister, Penny Radle of Mt. Holly; and several nieces and nephews. Scott was currently employed with E.K. Services, Inc. in New Cumberland as a laborer for the past five years. He worked for Lorne G. Seifert, LLC in Dillsburg, Liberty Excavators, Inc. in Camp Hill, and Rogele, Inc. in Harrisburg. Scott was a member of The Church of Jesus Christ of Latter-day Saints in the Carlisle Ward. He was a fan of the Pittsburgh Steelers and NASCAR. Scott loved to golf and often traveled to play whenever the opportunity was available. He was quite the jokester and incredibly fun to be around. Scott never stopped supporting his family by participating in their various activities and attending their important accomplishments. Above all else, he had a big heart and would often go out of his way to help anyone who needed it. All are welcome to join Scott’s family at his viewing on Monday, August 6, 2018, from 6:00 p.m. to 8:00 p.m. at Myers-Buhrig Funeral Home and Crematory and on Tuesday, August 7, 2018, from 9:00 a.m. to 9:45 a.m. with a service to begin at 10:00 a.m. at The Church of Jesus Christ of Latter-day Saints - Carlisle Ward, 216 Skyline Drive, Mechanicsburg, PA 17050; with Bishop Matthew Candland officiating. Burial will follow in Cumberland Valley Memorial Gardens in Carlisle. Honored to be pallbearers are: Dylan Gibb, Harris Glenn, Mervin Glenn, Matt Grant, Chris Radle, and Brandon Smith. Scott’s family invites everyone to join them for a time of food and fellowship at his church following the burial. In lieu of flowers, the family asks that everyone remember Scott’s life by playing a round of golf or taking part in any activity that Scott enjoyed. Scott’s family has entrusted his care to Myers – Buhrig Funeral Home and Crematory in Mechanicsburg, (717) 766-3421. Read Scott’s full obituary, view his memorial video and picture, and sign his official guest book at Buhrig.com.